LED Mask Plate is also available in red or blue. This model is designed for divers seeking maximum enjoyment from each dive. Diving is a visual sport. Have you noticed that advanced divers are always using high power dive lights? Sport divers may have different equipment than the most advanced divers, but the eyes of advanced divers are no different than the eyes of beginners. Don’t you think sport divers and even beginners deserve to see what advanced divers see? The answer is simple. 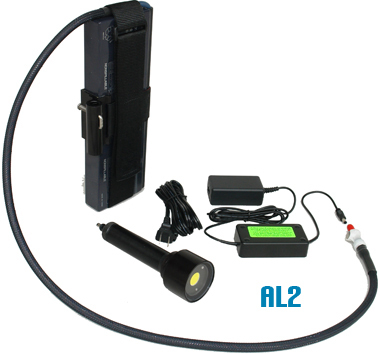 High power light is a must for a diver of any level who is seeking to get a maximum enjoyment out of each dive. The LED light heads are compatible with all PATCO battery packs. 14 Watts, 16 LEDs with 1,300 Lumens light output. 34 Watts, 25 LEDs with 2,400 Lumens light output. Two versions are available. Narrow 60 deg. flood and 120 deg. video. Please note that these light heads produce absolutely uniform light for the finest video shots. PATCO LED Light Heads feature the latest in state of the art technology. The life expectancy of the LED clusters is more than 50,000 Hrs. There are no fragile filaments or glass arc lamps to break. 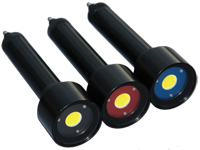 The solid state LED technology is the most reliable of all the lighting systems on the market. AL1-LED 14W-5 Hrs. AL2-LED 35W–2 Hr. AL1-LED 14W-10 Hrs. AL2-LED 35W- 3.5 Hrs. Universal 100-240VAC charger, battery and tank mounting straps are included. Rated Battery Depth: 160 Ft. Batteries are non-spillable sealed rechargeable lead-acid type. Their construction, case material and self regulating valves makes them suitable for diving without enclosures to 160 ft. NiMH Battery packs are also available with any system. NOTE: The pictured light system is shown with optional SR-71 Quick Mount System sold separately!